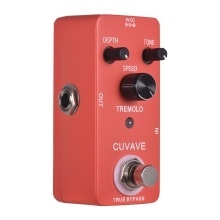 Classic tremolo effect pedal with various color and effect of the tremolo sound. 3 control knobs: DEPTH– adjust the tremolo depth, TONE– adjust the color/high frequency quality of your guitar, SPEED– adjust tremolo speed rate. True bypass footswitch for switching between tremolo effect and bypass status.